In case of geothermal heat pump systems utilizing thermal heat there are two possible ways of installation. The one is a 60 to 100 m deep vertical borehole heat exchanger while the other one is a horizontal ground collector system. While the general VDI 4640 guidelines are applicable for designing system of smaller efficiency, lower than 30 kW, the use of the guideline in case of the systems of larger efficiency resulted in oversizing of the heat pump systems, and rarely in undersizing of the system that reduces the efficiency of the heat pump system respectively increases the costs of investment and operation. In order to avoid the technical and financial over- and undersizing of the system in case of designing large systems we make response tests in every case and decide on the number of borehole heat exchangers to be drilled on basis of the territorial conditions and required efficiency. The most important element of the primary circle of borehole heat exchanger (BHE) system is to define the necessary length, number and distance of the boreholes. 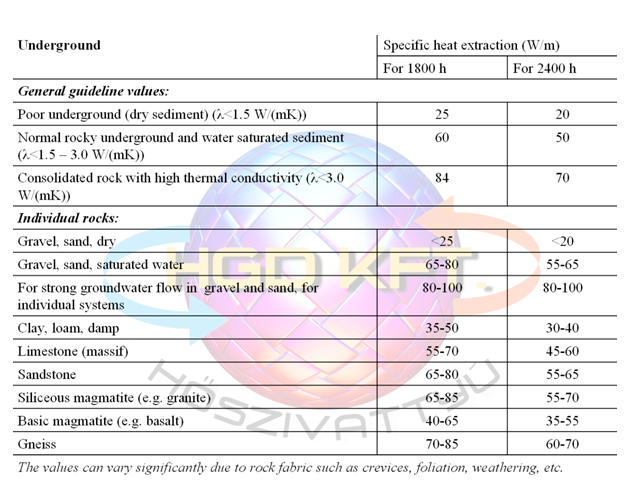 In case of smaller systems (until 30kW capacity) the VDI 4640 guidelines stipulate simple data for sizing, the specific heat extraction capacity of the borehole heat exchangers can be calculated from the data given in the chart below. When designing heat pump system the problem is that when the extracted heat output from primary side is determined also in case of large investments (30kW) by applying the rule of thumb. Unfortunately, this bad practice led to oversizing of the heat pump system and led rarely to undersizing that reduces the efficiency of the heat pump system respectively increases the costs of investment and operation. The length and number of BHEs calculated by preliminary assessment can be associated with errors from 25 to 40 % depending on local geological conditions. Therefore, we recommend that every heat pump geothermal system over 30 kW should be designed with the help of Thermal Response Test so that the designing of the heat pump system will be much more geologically reasonable. Thus, the BHE field can be optimized by conducting this test and so the installation and operation of the subsequent heat pump system will be not only cost efficient but also reliable in the long run. The heat quantity from shallow geothermal drilling is defined by the geothermal BHE-testing device developed for this purpose. The equivalent thermal conductivity value (λ), as determined above, reflects both the conductive heat transfer in the rock formation and the convective heat transfer due to groundwater movement. The obtained data from Thermal Response Test are evaluated based on two methods in favour of reliable results: the geological thermal conductivity can be determined with the purpose-developed German GeoLogik TRT Analysis Software and even with the traditional analytical method. After the interpretation of the results from the Thermal Response Test, modeling of the BHE field is performed using the EED [Earth Energy Designer] software. The possible heating and cooling capacities are obtained from model, using data from the client and the response test. 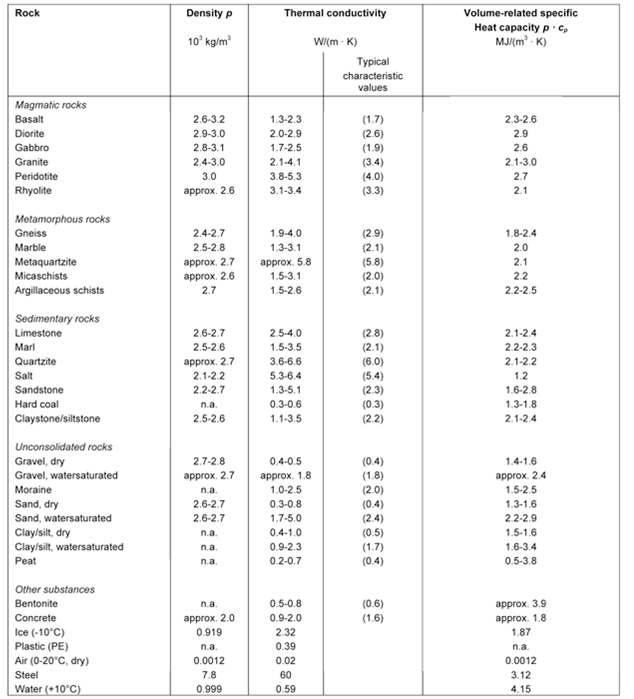 The setup of the BHE field is defined taking earlier data and results into account; decision is made about the optimal type, depth, number and setup of the BHEs. As a last working phase we write the construction design documentation of the BHE field.